This lighthouse, built in 1870 by Orlando M. Poe, is one of three Great Lakes towers built from the same plans. It replaced the smaller 1840 harbor light. The conical brick tower rises 113 feet from a limestone foundation. The Third Order Fresnel lens was make by Henre LePaute of Paris. Patrick Garrity, the keeper of the harbor light, lit the lamp for the first time at the opening of the 1871 navigation season. Garrity served here until 1885 when he became keeper of the Harbor Range Lights. His wife, Mary, sons Thomas, Patrick, and John, and daughter Anna all served as light keepers in this area. In 1890 a steam operated fog signal manufactured by Variety Iron Works of Cleveland, Ohio, was installed. 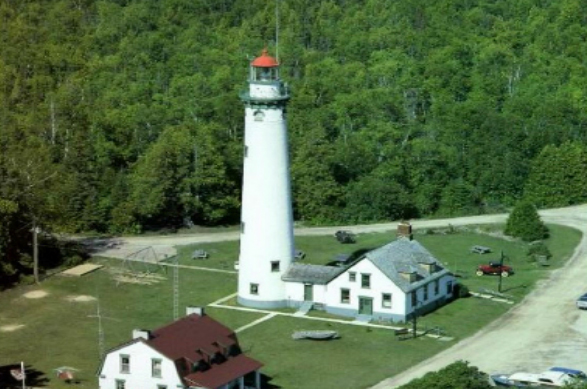 The light was automated in 1970 by the U.S. Coast Guard.